Wow. Now this is impressive. 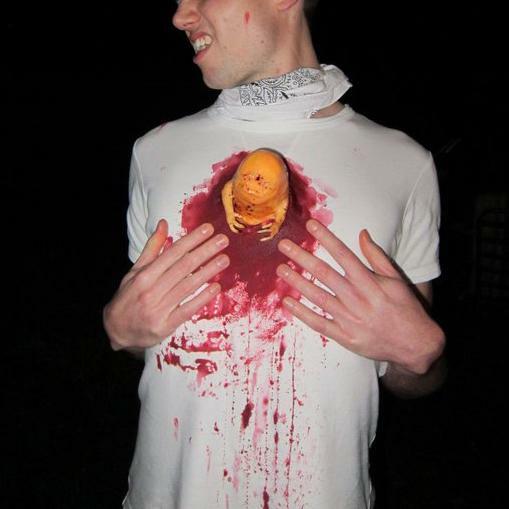 Tom sends in an incredible costume featuring a gory Plastimake chestburster from the movie Alien. Check out the inspiration scene on YouTube. When I needed to make a convincing Alien 'chestburster' model for a themed costume, Plastimake was perfect for the job. Easy to work with, and a terrifying final product! I sacrificed a zucchini to mould the basic shape of the alien with Plastimake, then carved in mouth details and attached arms while it was still malleable. To give the alien more of a flesh colour, I massaged a little dye through the Plastimake when first melting it. I included holes in the base of the model to thread some cord, so the alien could be comfortably and convincingly mounted on my chest. 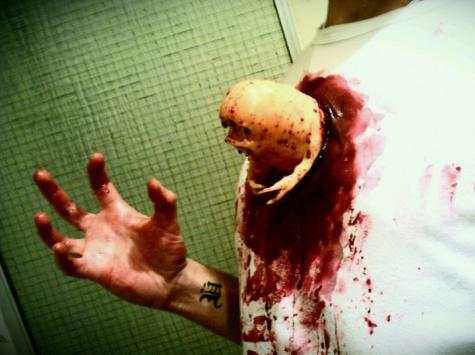 Finally, once it was bursting through an old T-shirt, I gave it a coat of Vaseline for that trademark alien sheen, then applied fake blood liberally. Testimony is in the number of horrified faces I saw that night!